This Hipster Chick Easter Wreath adds a fun twist to the Easter season and it's also super easy to assemble. When the season is over, simply remove the Easter wall hanging and continue using the wreath base and bow for the remainder of Spring. Start by placing your wall hanging in the center of your wreath and attaching it to the back with t-pins. TIP: The two hinges on the back side of the wall hanging make it easy to attach to the wreath. Leave the rope tie on the top and simply tuck it in the back. Tie a simple looped bow and use a t-pin to attach it to the wreath. TIP: The easiest way to tie this bow is to make two large overlapping loops with tails and tie another piece of the ribbon over the center. Pull apart the loops, adjust to your liking, and trim the tails of the ribbon. 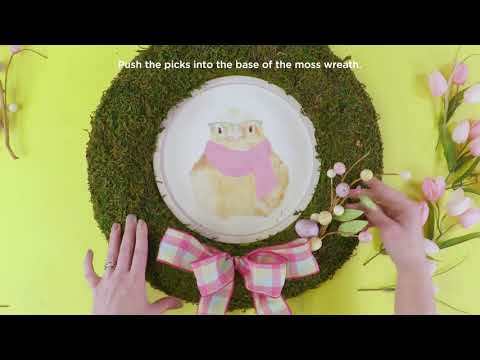 Push some Easter egg picks into the base of the mossy wreath. Cut apart the tulip bushes into individual stems. Push the leaves higher on the individual tulip stems; then add the tulip stems to the wreath. Loops & Threads™ T-Pins, 1 1/2"